Want to win this AMAZING Steampunk Butterfly Necklace with Swarovski crystals from Inspired by Elizabeth? Winner announced on March 31st. Links will be posted on Facebook & Twitter. Winners will also be notified through e-mail. Giveaway is open worldwide & includes FREE SHIPPING. See details below to enter. This month there are many ways to enter! Please place each entry as a SEPARATE comment on my blog and make sure at least one has your e-mail address so I can contact you if you are the winner. Winners have one week to respond to my e-mail or a new winner(s) will be chosen. already add a comment stating so. This entry was posted in Announcements, Giveaways and tagged Accessories, clockwork, clockwork rings, elizabeth, etsy business, etsy jewelry, etsy store, giveaway, handmade jewelry, inspired by elizabeth, inspiredbyelizabeth, inspiredbyelizabeth.com, jewelry, mothers ring, steampunk, steampunk jewellrey, steampunk jewelry, steampunk ring, steampunk rings, unique ring, vintage fashion. Bookmark the permalink. Thus far, I have pinned to of your lovely necklaces to my page! I really love http://www.inspiredbyelizabeth.com/Steampunk-Necklace-Aquamarine-Blue-Jewel-Steam-Jewelry-Swarovski-345876.htm and it’s my birth stone. 6. on your etsy store my favorite item is: http://www.etsy.com/listing/108864077/bridesmaids-earrings-blue-sapphire? My favorite item from your website is the pair of Blue Bridesmaids Earrings Cobalt Sapphire Aquamarine Silver. My favorite things from your etsy store are the cameo bobby pins. I repined this pin on Pinterest. My favorite item is the Steampunk Necklace Aquamarine Blue Jewel Steam Jewelry Swarovski. My favorite item in your Etsy store is Crystal Earrings Bridal Jewelry. My favourite item from your etsy shop is http://www.etsy.com/listing/110738438/steampunk-necklace-wing-jewelry-custom? From your shop, I love the Steampunk Necklace Steam Punk Dragonfly Jewelry. This is my favorite item http://www.etsy.com/listing/100373193/mens-steampunk-ring-custom-jewelry-gifts? I found you via Luchessa who posted about your beautiful work. I have you on Pinterest, Twitter, Facebook and WP. Good luck to everyone who’s entered! My fave item on the etsy shop is http://www.etsy.com/listing/106879399/butterfly-steampunk-necklace-steam-punk? It is just utterly gorgeous! I added your link to the Giveaway Chest Linky on my blog! I love the Vintage Opal Glass ring on your new website. Really beautiful! My favorite item from your shop is the November Topaz Clockwork Steampunk Necklace. I love the colors! My favorite item on Etsy store is http://www.etsy.com/listing/102532850/steampunk-necklace-wing-red-steam-punk? I visited your Etsy site. I love the steampunk rings. I visited your Etsy site. My favorite item is the steampunk mother’s ring. Your work is beautiful! My favorite from your website is the Steampunk Necklace Purple Multicolor Vitrail Vintage Jewel. My favorite from your etsy store is the Butterfly Steampunk Necklace Steam Punk Blue. My favorite item from your etsy shop is the Steampunk Necklace Wing Red: http://www.etsy.com/listing/102532850/steampunk-necklace-wing-red-steam-punk? and my favourite item is this http://www.inspiredbyelizabeth.com/Steampunk-Jewelry-Ring-Peridot-Aquamarine-Blue-Green-17352.htm It’s so beautiful and original! I suscribed to your blog! I’ve also visited your Etsy store, and this ring is so cute! I love it! http://www.etsy.com/listing/100373193/mens-steampunk-ring-custom-jewelry-gifts? Liked Inspired by Elizabeth on Facebook. My favorite item would be the Rainbow Multicolor Necklace Vitrail Jewel Brass Green Pink Blue. the jewelry is beautiful. I’m in love with a few pieces already! I follow on twitter. Yvonne5987. My favorite…Vintage Earrings – Antique Emerald Green Rhinestones – Bridal Bridesmaids Handmade by Inspired by Elizabeth. I repinned this: http://pinterest.com/pin/183873597258618736/ on Pinterest. I absolutely LOVE the pink flower ring! I follow you on Twitter. My name is Froglovingal. I’m following your blog. My e-mail is lilypadzandfrogs (at) gmail (dot) com. I really like the pink heart earrings on your Etsy store. I like Inspired by Elizabeth on fb (io sophia). That is a stunning necklace! Thank-you for the awesome giveaway! I LOVE this necklace http://www.etsy.com/listing/82264795/steampunk-necklace-steam-punk-jewelry? I love the Yellow Jonquil & Green Peridot Glass Earrings on Etsy! I like the Steampunk Necklace Navy Montana Blue Jewel in your new shop! I like the steampunk purple multi-color necklace on your website. I like the steampunk necklace red wing in your etsy shop. My fave Etsy item is: http://www.etsy.com/listing/100016106/antique-earrings-pink-peach-octagon? My favorite item is the emerald green jewel necklace. I love the custom Birthstone Wing Necklaces you have. I like the Emerald Green Heart Earrings you have available on Etsy. My favorite item from your Etsy : http://www.etsy.com/listing/121415068/bridesmaids-jewelry-crystal-earrings? I visited your site and I was torn. I, of course, being Butterfly love your line of butterfly necklaces but my actual favorite is Petite Earrings Pink Crystal Cream Pearl June Vintage because of the deep pink color of the crystal. I faved your Etsy shop and my favorite item from there is the vintage ruby glass earrings again because of the great color. I am following you on Pinterest and have repinned several rings and pendants. My favorite item from your new website is Steampunk Ring Clockwork Steam Punk Silver Sz 6-12 Unique. My favorite item from your Etsy store is Purple & Blue Earrings Montana Blue Navy Amethyst Vintage Bridesmaids Jewelry Wedding Earrings. I like the Steampunk Necklace Navy Montana Blue Jewel. I love the Mother Ring Birthstone! im doing the pinterest and fb stuff. cute necklace! My fave item is Rose Ring Flower Ring Aqua Blue Handmade Jewelry, love the new site! My favourite item from etsy store is http://www.etsy.com/listing/111486287/peacock-wedding-jewelry-necklace? http://www.inspiredbyelizabeth.com/Steampunk-Necklace-Emerald-Green-Jewel-Steam-Jewelry-46734.htm That is my favorite piece on your new site! I saw your site and zomg I love everything. I can’t really choose one so these three are all favourites. BTW I for number 3, I noticed that the name of the product is abit… misleading? Pardon me if I’m wrong but aren’t those heart earrings red, not blue? I have share this to facebook but I don’t really know how to link it……. 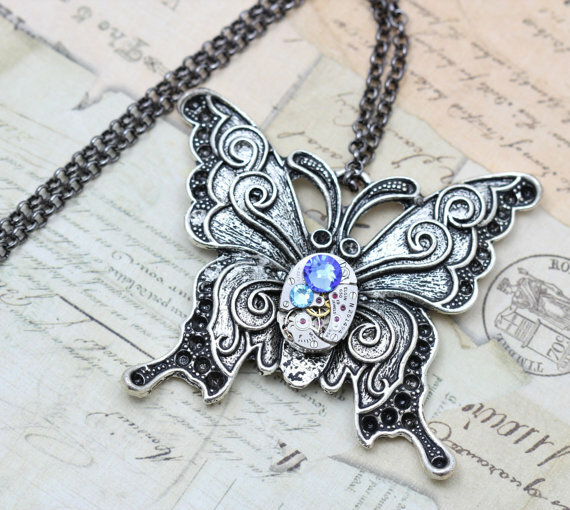 I like the Butterfly Steampunk Necklace Blue. My favorite from your new website is the Vintage Ring Opal Glass Cabochon in Gold. So sparkly! It’s so hard to choose but my favorite item is the Emerald Green Jewel Steampunk Necklace, I love the color of that jewel! I like you on FB as Sandy Hardman. I am already subscribed to your blog. Emerald Jewel Necklace Steampunk Victorian Vintage Brass Green this is my favorite item…. My fav in your store are the Vintage Jewel Earrings – Montana Blue Sapphire & Light Amethyst. Love that deep blue. I like the Dragonfly Necklace Steampunk Emerald Green Swarovski Crystals. I like the Peacock Earrings. They are so beautiful. I love the purple multicolor Vitrail necklace! From your website, I like the Steampunk Necklace Purple Multicolor Vitrail Vintage Jewel (necklace). I like the Topaz Vintage Earrings! My favorite is the Steampunk Necklace Aquamarine Blue Jewel Steam Jewelry Swarovski. Beautiful necklace. Thanks for having this contest. I love the Blue Aqua Cobalt Bridesmaids Earrings.